Slavery abolished 150 years ago? - Yeah, right. British Special Forces Training Syrian Rebels? Can nut-cases be useful? Ask the man in the moon. At least since Joseph Schumpeter we know that credit is good for economic growth. At least since 2007 we know that too much credit foreshadows financial turmoil. Inspired by Keynes and Minsky, Dirk Bezemer pieces together a cross-country data set of credit and debt, investigating whether the two faces of credit are different for different forms of credit. And using agent-based modeling, he strives to capture the interaction between the financial and the real -- this is new economic thinking. A Kitchener father is angry at police after he was arrested at his child's school and later strip-searched at the police station, all because his 4-year-old daughter drew a picture of a gun in class. A recent study has suggested that the conditions caused by a mild drought might have been the reason for the collapse of the Mayan civilization. The research published in the journal Nature says a continuous 25 to 40 percent drop in rainfall reduced water supplies in the homeland of the ancient Maya civilization located in what is now southern Mexico and Guatemala. Researchers at the Yucatan Centre for Scientific Research in southern Mexico and the University of Southampton used modeling techniques in order to estimate the rates of rainfall and evaporation between 800 and 950 CE, the decline period of Maya civilization. "These reductions amount to only 25 to 40% in annual rainfall, but they were large enough for evaporation to become dominant over rainfall, and open water was rapidly reduced," said Professor Eelco Rohling of Southampton University. "Societal disruptions and abandonment of cities are likely consequences of critical water shortages, especially because there seems to have been a rapid repetition of multi-year droughts," he added. Scientists have been analyzing different factors that could have been involved in the collapse of the classic Maya civilization for years offering theories such as social unrest, disease and deforestation. Iran has refused to deliver a 500,000-barrel shipment of oil to Greece in response to EU oil sanctions imposed against the country. According to a report by Fars News Agency on Sunday, oil tankers that had come to transfer 500,000 barrels of Iranian crude oil to Hellenic refining complex in Greece were forced to return empty-handed after the Islamic Republic refused to deliver the shipment. European Union foreign ministers agreed on January 23 to ban oil imports from Iran and to freeze the assets of the Iranian Central Bank across the EU. The sanctions will become fully effective on July 1, 2012, to give EU member states enough time to adjust to the new conditions and find alternative crude oil supplies. The EU decision followed the imposition of similar sanctions by Washington on Iranian energy and financial sectors on New Year’s Eve which seek to punish other countries for buying Iran oil or dealing with the its central bank. The 2-minute video is a public meeting of former US Ambassador to the UN John Bolton responding to a US war veteran's question. The video shows that FOX then edits-out the audience response to replace it with applause from a different person's question. The proof is that the applause-segment shows a different person walking away from the microphone than the person who asked the question. The veteran testified that the audience booed Mr. Bolton's answer. The husband of Finland's president was caught on camera casting an admiring glance at the cleavage of Princess Mary of Denmark. ­A decade ago, Argentina too went through a systemic Sovereign Public Debt collapse resulting in social turmoil, worker hardship, rioting and street fights with the police. Some months before Argentina exploded, then-President Fernando de la Rúa – forced to resign at the height of the 2001 crisis – had called back as finance minister the notorious pro-banker, Trilateral Commission member and Rockefeller/Soros/Rhodes protégée Domingo Cavallo. Cavallo was the gruesome architect of Argentina’s political and economic capitulation to the US and UK when he was President Carlos Menem’s foreign minister and economy minister in the ’90s. Menem and Cavallo are primarily responsible for Argentina’s signing of a formal Treaty of Capitulation with the UK/US after the 1982 Falklands War, opening up our economy to unrestricted privatization, deregulation and grossly excessive US Dollar-indebtedness, almost tripling our sovereign debt in a few short years (see my February 11, 2012 article British Laughter in the Falklands). During that very hot summer in December 2001, true to its Latin temperament, Argentina even had four (yes, 4!) presidents in just one week. One of them, Adolfo Rodriguez Sáa, who only lasted three days, at least did one thing right, even if he did it the wrong way: he declared Argentina’s default on its sovereign debt. All hell broke loose! 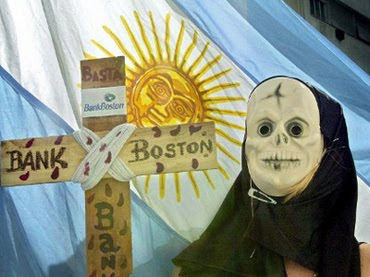 The international bankers and IMF did everything they could to break Argentina’s back; global media pundits predicted all kinds of impending catastrophes. Debt default meant Argentina would have to weather the pain and agony alone, being cast out by the “international financial community”. While gun ownership continues to be a political hot button issue, one trend is clear. The number of Americans who own guns has continued to rise. 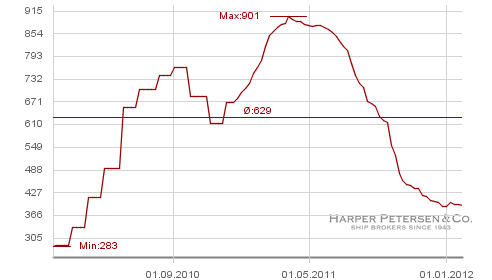 2011 saw a dramatic rise in gun sales and, so far, 2012 appears to be an even better year for the manufacturers. In January 2012, the National Shooting Sports Foundation’s (NSSF) adjusted National Instant Criminal Background Check System (NICS) numbers showed an increase of 17.3 percent in gun purchase related checks compared to the same time period the previous year. January marks 20 straight months of increased NICS report requests. While background checks don’t automatically turn into purchases, it is unlikely that many people would go through the trouble and expense of getting a background check and then not make a purchase. The Shooting, Hunting, Outdoor Trade Show (SHOT Show) held in Las Vegas in January, reached a new record with more than 61,000 in attendance, including over 36,000 buyers and 1,600 exhibitors. Much inventory was ordered and sales are expected to remain strong. With money currently tight, why are people increasingly choosing to purchase relatively expensive guns and ammunition? A recent major oil and gas find is bound to change dramatically the geopolitical equation in the Eastern Mediterranean region and beyond. To start with, it has sent Israel from rags to riches in terms of energy independence and security. 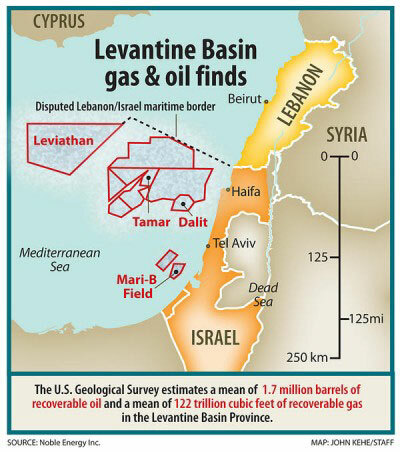 However, Lebanon contends that part of the gas field lies within its territorial waters, and Washington happens to agree. Engdahl explores the implications of this key development, which have already rippled into the U.S. electoral scene, with Netanyahu betting on Republican race horses against Obama. The two indexes above indicate a significant reduction in freight rates for goods, both raw materials and finished products. It has been argued that the reduced freight rates are a result of increased tonnage coming on stream, and while this may have some impact on the numbers, the correlation between the two indexes indicates that other forces are at play as well. Perhaps no question within the scope of 9/11 research generates as much heat and as little light as questions that have arisen over the role of the aircraft on 9/11, which has come to be known by the name of “planes/no planes” and of “video fakery”. While I had long since concluded that no plane had crashed in Shanksville and that, while a Boeing 757 appears to have flown toward and then over the Pentagon, I was personally unable to bring myself to take the idea that no real airplanes had hit the North or the South Tower until nearly two years of being verbally assailed by Morgan Reynolds, who understood these issues far better than I, where his studies can be found on his web site, nomoregames.net, especially a response to criticism he has received for raising the issue during a FOX News appearance. Can a return to the drachma save Greece as unemployment soars? Greece’s unemployment bomb has detonated. After a deceptive calm, the surge in job losses since last summer is shocking even for those who never believed that combined fiscal and monetary contraction could possibly lead to any result other than ruin. A variant of this lies in store for Portugal as its "internal devaluation" starts in earnest. The young Schumpeterians in charge of the Portuguese economy insist otherwise - cocksure that shock therapy will triumph without the cushion of debt relief and devaluation - but events have a habit of demolishing dreams. In November alone 126,000 Greeks lost their jobs in a country of 11 million, equivalent to three and a half million Americans in a single month. The unemployment rate jumped from 18.2pc to 20.9pc. This has not yet fed through into social breakdown. Greeks receive unemployment support for an average of thirty weeks, with a ceiling of €454 a month, according to Professor Manos Matsaganis from Athens University. Those with civil service tenure are placed on labour reserve for two years at half their basic pay, or a third of their actual pay. Once these cushions are exhausted, Greeks are on their own. The monthly ratchet effect will then become painfully evident. It is why the Orthodox primate Hieronymos II warned in a letter to the prime minister that ever further doses of the same "deadly medicine" is becoming dangerous. 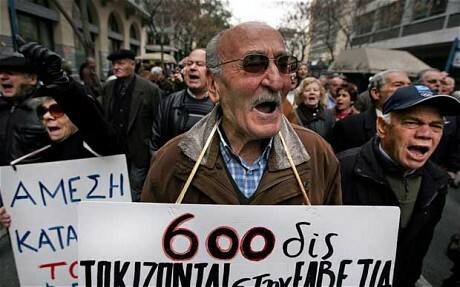 "The voices of the desperate, the voices of Greeks are being provocatively ignored. Fear is giving way to rage and the risk of a social explosion can no longer be ignored by those who give orders and those who execute their lethal recipes," he said. Slogans on the pickets included: “OUR OILSANDS ARE WORTH $150 TRILLION. HOW MUCH OF THIS WEALTH WILL BENEFIT ALBERTANS”, “WE ARE LOSING $24,000,000/DAY OF ADDED VALUE”, “LET’S GET FULL VALUE FOR OUR OILSANDS. IT’S ABOUT OUR MONEY!”, “WHAT ALBERTA UPGRADES, UPGRADES ALBERTA”, “PROVIDE JOBS FOR ALBERTANS BY BUILDING AND OPERATING UPGRADER PLANTS”, “WITH KEYSTONE XL WE WILL LOSE $40,000,000/DAY OF ADDED-VALUE”, “EXPORT SYNTHETIC CRUDE OIL NOT BITUMEN”, “BUILD UPGRADERS NOT BITUMEN PIPELINES”, “STOP BITUMEN EXPORTS NOW”, “STOP THE KEYSTONE COPS! (CANADIAN OIL PROFITS going SOUTH)”. As government forces continue a brutal crackdown on popular uprisings throughout Syria, there has been growing chatter indicating that British Special Forces are in some way assiting forces aligned against the Syrian regime. Reports from late November last year state that British Special forces have met up with members of the Free Syrian Army (FSA), the armed wing of the Syrian National Council. The apparent goal of this initial contact was to establish the rebel forces' strength and to pave the way for any future training operations. Ayman Al-Zawahiri, Al-Qaeda’s number one following the official death of Osama Bin Laden, reiterated his call for hijad to overthrow the Baasist regime in Syria. For eleven months, the Western powers and the Gulf States have lead a campaign to destabilize Syria. Several thousand mercenaries infiltrated the country. Recruited by agencies in Saudi Arabia and Qatar within the Sunni extremist community, they came to overthrow the "usurper Alawite" Bashar al-Assad and impose a Wahhabi-inspired dictatorship. They have at their disposal the most sophisticated military equipment, including night vision systems, communication centers, and robots for urban warfare. Supported secretly by the NATO powers, they also have access to vital military information, including satellite images of Syrian troop movements, and telephone interceptions. This has been falsely portrayed to the Western public as a political revolution crushed in blood by a ruthless dictatorship. Of course, this lie has not been universally accepted. Russia, China and the Latin American and Caribbean member states of ALBA repudiate it. They each have a historical background that allows them to readily grasp what is at stake. The Russians are thinking of Chechnya, the Chinese of Xinkiang, and the Latin Americans of Cuba and Nicaragua. In all these cases, beyond ideological or religious appearances, the methods of destabilization by the CIA were the same. The austerity policy being forced on Greece by Germany and the eurozone cannot command democratic consent over time. The last time Germany needed a bail-out from world creditors, it secured better terms than shattered Greece last week. The US, Canada, Britain, France, Greece, and other signatories at the London Debt Agreement of 1953 granted Chancellor Konrad Adenauer a 50pc haircut on all German debt, worth 70pc in relief with stretched maturities. There was a five-year moratorium on interest payments. The express purpose was to give Germany enough oxygen to rebuild its economy, and to help hold the line against Soviet overreach. This sweeping debt forgiveness caused heartburn for the British - then in dire financial straits, themselves forced to go cap in hand to Washington for loans. The Greeks had to forgo some war reparations. Yet statesmanship prevailed. The finance ministers of the day agreed to overlook the moral origins of that debt, and the moral hazard of “rewarding” a country that had so disturbed the European order. The Wirtschaftswunder whittled down the burden of German debts to modest levels within a decade. Germany emerged as a vibrant democracy and a pillar of the western security system. Greece has less strategic relevance, and must comply with tougher terms. Greece Riots: Have Greeks Had Enough of Austerity? 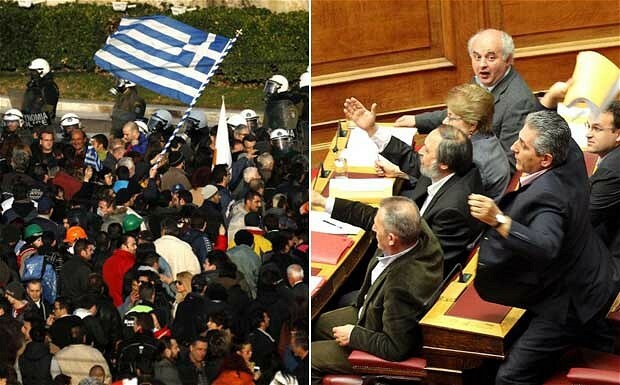 After yet another push for austerity, Greeks have finally had enough, staging massive riots. Barbie Latza Nadeau on how the euro zone’s other teetering economies are taking note. The burnt-out shells of at least 45 buildings in central Athens were still smoldering on Monday morning after a weekend of angry protests reached its apex on Sunday night in what Greek Prime Minister Luca Papademos called the worst breakdown of violence since 2008. Broken glass, chunks of marble ripped from the public squares, and empty tear-gas canisters lined the streets after an all-night battle pitted protesters against security forces who say they were outnumbered by a 5–1 ratio. Hundreds of protesters and police officers were injured and local Greek Sky television reported that at least twice, security forces ran out of tear gas. The Libyan Transitional National Council (TNC) regime installed by the US-NATO intervention in Libya last year is responsible for ongoing atrocities, particularly against black-skinned Libyans, detainees and other alleged supporters of the previous Gaddafi government. One of the most recent incidents occurred on February 6 at a former naval base in the Janzour district of the capital, Tripoli. The base is being used as an internal refugee camp for about 1,500 predominantly dark-skinned former residents of the town of Tawergha. The camp inhabitants told Reuters that militiamen from the coastal city of Misrata arrived, searched the camp and attempted to remove several young men. When the unarmed refugees protested, the militia opened fire, killing at least five people. Former Tawergha residents marched through Janzour later that day in protest, but were again fired upon. According to the “Libya S.O.S.” blog, two Tawerghan children, Mohammad Attia Saleh and Freih Abdel Moula, were among those killed. The report puts the number of dead throughout the day at 12, with 31 wounded. The reprisals against the Tawerghan population are only the latest revelations of war crimes committed by the US and NATO proxy forces. Amnesty International and Doctors Without Borders have recently published statements protesting against the systematic abuse and torture of prisoners in detention centers controlled by the TNC and tribes. The Regressive Conservatives (Wildrose Alliance) claim that they would encourage more bitumen upgrading in Alberta with tax and regulatory changes. The Progressive Conservatives are considering a similar approach. We don’t need to give the oil industry any more tax incentives. Enough carrots; it’s time for a stick! The oil industry has become fat and slothful from the carrots we’ve given it. It’s time we Albertans, the owners of Alberta’s oil sands, prodded the industry to do what we want it to do. We must tell oil sands developers that exporting bitumen is no longer an option. The government must legislate a policy that would require all bitumen produced from our oil sands to be upgraded to synthetic crude oil in Alberta. Oil sands licences should only be given to companies that include upgrading in Alberta as part of their development process. Companies that currently do not have access to upgrading facilities in Alberta should be required to do so within the next five years. The Alberta Bitumen Upgrading Company should be established to provide upgrading to bitumen producing companies that don’t have the expertise, capital or desire to be in the upgrading business. These upgrader deficient companies would be invited to be shareholders as would all Albertans and the Alberta government. Company ownership and management would be modelled along the lines of the Alberta Gas Trunk Line Company established by the Social Credit government in 1954. For anyone paying attention, there is no shortage of issues that fundamentally challenge the underpinning moral infrastructure of American society and the values it claims to uphold. Under the conceptual illusion of liberty, few things are more sobering than the amount of Americans who will spend the rest of their lives in an isolated correctional facility – ostensibly, being corrected. The United States of America has long held the highest incarceration rate in the world, far surpassing any other nation. For every 100,000 Americans, 743 citizens sit behind bars. Presently, the prison population in America consists of more than six million people, a number exceeding the amount of prisoners held in the gulags of the former Soviet Union at any point in its history. 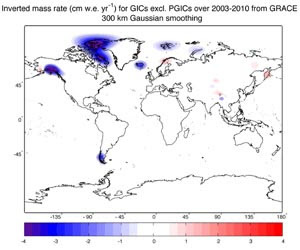 Changes in ice thickness (in centimeters per year) during 2003-2010 as measured by NASA's Gravity Recovery and Climate Experiment (GRACE) satellites, averaged over each of the world's ice caps and glacier systems outside of Greenland and Antarctica. Blue represents ice mass loss, while red represents ice mass gain. Image credit: NASA/JPL-Caltech/University of Colorado. Earth's glaciers and ice caps outside of the regions of Greenland and Antarctica are shedding roughly 150 billion tons of ice annually, according to a new study led by the University of Colorado Boulder. The research effort is the first comprehensive satellite study of the contribution of the world's melting glaciers and ice caps to global sea level rise and indicates they are adding roughly 0.4 millimeters annually, said CU-Boulder physics Professor John Wahr, who helped lead the study. The measurements are important because the melting of the world's glaciers and ice caps, along with Greenland and Antarctica, pose the greatest threat to sea level increases in the future, Wahr said. The researchers used satellite measurements taken with the Gravity Recovery and Climate Experiment, or GRACE, a joint effort of NASA and Germany, to calculate that the world's glaciers and ice caps had lost about 148 billion tons, or about 39 cubic miles of ice annually from 2003 to 2010. The total does not count the mass from individual glacier and ice caps on the fringes of the Greenland and Antarctic ice sheets - roughly an additional 80 billion tons. "This is the first time anyone has looked at all of the mass loss from all of Earth's glaciers and ice caps with GRACE," said Wahr. "The Earth is losing an incredible amount of ice to the oceans annually, and these new results will help us answer important questions in terms of both sea rise and how the planet's cold regions are responding to global change." Washington has made tremendous preparations for a military assault on Iran. There is speculation that Washington has called off its two longest running wars -- Iraq and Afghanistan -- in order to deploy forces against Iran. Two of Washington's fleets have been assigned to the Persian Gulf along with NATO warships. Missiles have been spread amongst Washington's Oil Emirate and Middle Eastern puppet states. US troops have been deployed in Israel and Kuwait. In addition to the massive military preparations, there is the propaganda war against Iran that has been ongoing since 1979 when Washington's puppet, the Shah of Iran, was overthrown by the Iranian revolution. Iran is surrounded, but Washington and Israeli propaganda portray Iran as a threatening aggressor nation. In fact, the aggressors are the Washington and Tel Aviv governments which constantly threaten Iran with military attack. On the 24th January, the day President Obama delivered his last State of the Union speech to Congress before the election, citing the: “selflessness and teamwork of America’s Armed Forces (their) focus on the mission at hand”, the “selfless” Staff Sgt., Frank Wuterich, leader of the massacre at Haditha, in Iraq, became the seventh soldier to walk free - from the mass murder of twenty four unarmed men, women and children, in three homes and a taxi. It was another chilling, ruthless, cold blooded, up to five hour rampage, revenge for the death a colleague, in a roadside bomb - which had nothing to do with the rural families that paid the price. The youngest to die was one year, the oldest was seventy six year old, wheelchair-bound amputee, Abdul Hamid Hassan Ali. He died with nine rounds in the chest and abdomen. Shanghai shipping volumes contracted sharply in January as Europe's debt crisis curbed demand for Asian goods, stoking fresh doubts about the strength of the Chinese economy. The shipping specialist Lloyd's List said container traffic through the Port of Shanghai - the world's largest - fell by 100,000 boxes in January from a year earlier, or 4pc. Volumes fell by over one million tonnes. The figures may have been distorted by China's Lunar Year but there has been a relentless slide in the Shanghai transport data for months. 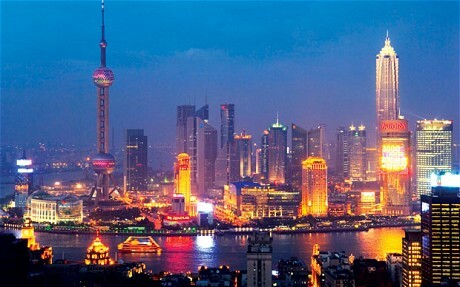 "China's shipping markets face grievous challenges," said the Shanghai International Shipping Institute. It acknowledged that the industry in the grip of downturn and likely to face a "worsening situation" in early 2012. The biggest falls in container volumes have been on the Asia-Europe route. The data came as the International Monetary Fund warned that China is vulnerable to the "clear and present danger emanating from Europe" and could see growth halve to roughly 4pc if the crisis escalates. The BBC's impartiality has been called into question by British lawmakers after the corporation was accused of becoming the "propaganda arm" of the European Union. The revelation came when the BBC admitted in a letter that it has received nearly £3million in grants from the EU since 2007, The Daily Telegraph disclosed. It also acknowledged that its commercial arm the state-run BBC Worldwide has borrowed more than £141million from the European Investment Bank since 2003 -- and £30million is still due to be repaid by the end of May this year. This is while questions have been raised about the uncritical tone of the BBC’s EU coverage. David Cameron’s veto of an EU treaty at the end of last year was reported from the perspective of Brussels -- rather than the British taxpayers who pay the wages of the vast army of BBC correspondents and executives. Ukip MEP Paul Nuttall criticized the corporation and said, "The old joke that the BBC is the Brussels Broadcasting Corporation may be true after all." In 2010, Jonathan Charles, the former BBC Brussels correspondent, admitted he and the BBC got carried away by the launch of the euro in 2002. And Eurosceptic think-tank Global Britain found that over the past six years just 0.04 percent of coverage on Radio 4’s Today program was devoted to the potential benefits of withdrawing from the EU. Tory MP Priti Patel also warned, "How can a public-service broadcaster demonstrate genuine impartiality on European issues if it is in receipt of EU funds?" However, a BBC spokesman said, "Grants from the EU make up a relatively small proportion of the total figure. The vast majority of EU grants are used for research and development." Against whom is the European Union’s so-called “oil embargo on Iran” really aimed at? This is an important geo-strategic question. Aside from rejecting the new E.U. measures against Iran as counter-productive, Tehran has warned the member states of the European Union that the E.U. oil embargo against Iran will hurt them and their economies far more than Iran. Tehran has thus warned the leaders of the E.U. countries that the new sanctions are foolish and against their national and bloc interests. But is this correct? At the end of the day, who will benefit from the chain of events that are being set into motion? Abdel Hakim Belhaj, chief of ’Al-Qaeda in Libya’ and commander of the "Free" Syrian Army. 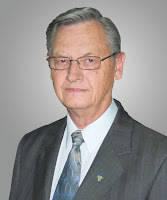 In this article Boris Dolgov, a member of the Russian Academy of Sciences and the Institute of Oriental Studies in Moscow, reports on his recent trip to Syria. His field investigation is particularly valuable since most of the information about Syria in recent months has emanated from Beirut, Paris or London. Professor Dolgov confirms that, far from a contrived "Arab Spring" scenario, Syria is undeniably grappling with the threat of foreign occupation. He observes that while the offensive is inordinately violent, the population will not be intimidated. Aware of the disaster wrought by NATO "humanitarian" operations in Yugoslavia and Libya, the Syrians refuse to be drawn into a sectarian ambush. A process of reform and development is on track, but it will not be dictated from abroad. In Syria, one may object to the president, but not to national sovereignty. "In Homs, Idlib and Hama, the Observer Mission witnessed acts of violence being committed against Government forces and civilians that resulted in several deaths and injuries. Examples of those acts include the bombing of a civilian bus, killing eight persons and injuring others, including women and children, and the bombing of a train carrying diesel oil. In another incident in Homs, a police bus was blown up, killing two police officers. A fuel pipeline and some small bridges were also bombed."